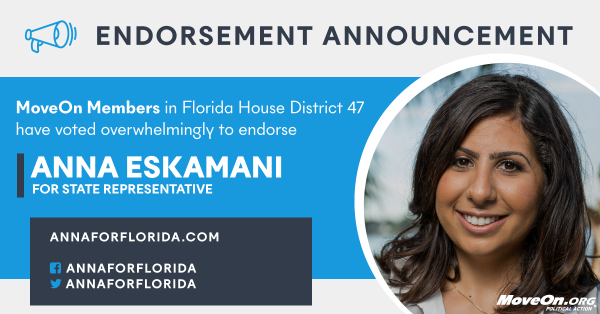 MoveOn members endorse Anna Eskamani for Florida House District 47! Anna has received the endorsement of MoveOn! Read the email below that MoveOn sent to their members! The results are in: With 98% of votes cast in favor, MoveOn members have voted to endorse Anna Eskamani for Florida State House District 47. Click here to learn more about Anna, and sign up for her campaign. Anna Eskamani is running a strong campaign with a bold progressive vision. An Orlando native, she has a long history of fighting for all Floridians. She believes that health care is a right, not a privilege, and she will be a fierce advocate for expanding affordable access to health care for everyone, especially women. Anna is running for this open seat against two Republicans. This is our chance to flip this seat, in a district that Hillary Clinton won by 7 points, from red to blue. Not only could we flip the seat, we could fill it with an unabashed progressive who has been an active MoveOn member for years and who will work to increase access to education, to ensure equal pay for equal work, and to make sure that all our communities are represented and have a voice in the political process. If we want qualified, progressive elected leaders such as Anna Eskamani in higher office, we also need to support qualified state and local candidates. Join Anna‘s energetic and powerful grassroots campaign today.